Anonymous hackers Starts Project Tarmeggedon , Presents by Operation Green Rights. Hackers calling everyone to Protest. This week, activists are gathering along U.S. Highway 12 in Montana to protest the transformation of a serene wilderness into an industrial shipping route, bringing "megaloads" of refinery equipment to the Alberta Tar Sands in Canada (see Tar Sands FAQ Sheet below). We will, over the course of the next few days, use the powers we posses to spread news about this scenario and the corporations involved. We are actively seeking leaks to expose the corruption that we all KNOW is beneath this. Anonymous will support the activists on July 13-14 when they initiate civil disobedience and direct action to confront this dire issue. We urge you to get involved. Montana and Idaho citizens, we ask you to join local protests and attend the Highway 12 rally if you are close enough! If you're not, join us in the IRC listed below for our own good times. The continued development of the tar sands is a major step backward in the effort to curb global warming. 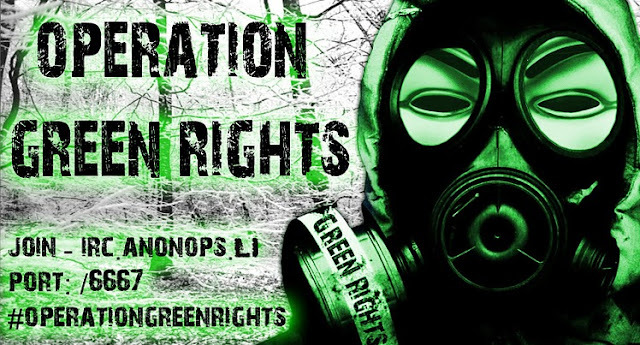 Anonymous will not suffer this without a fight, and Operation Green Rights will always support the rights of the people to live in an unpolluted world, and aim to help safeguard it for the future. One way or another.